There had been hints of big things coming all season. 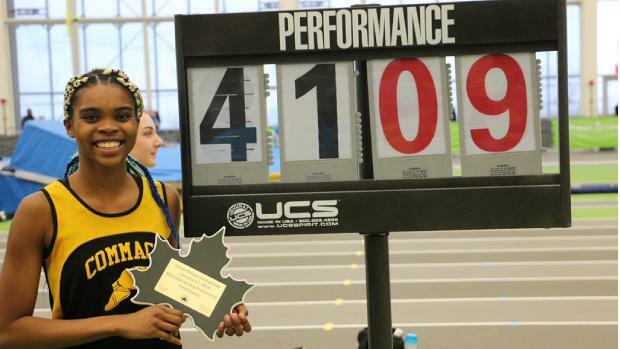 Junior Alissa Braxton (Commack) first jumped onto the scene when she cleared 40-0 even to close out the month of December, out at Suffolk Community College. Some people were skeptical. It is unusual for a jumper to gain 3-feet to their personal best in one outing, especially at that level. But then she did it again. Braxton was hovering around the 39-foot range for much of January, but again popped a big mark of 40-2 at her League Champs. Both big jumps came from the same pit. In fact, she had jumped nine times this season, and only once was it not on her home track. It was time for a change. 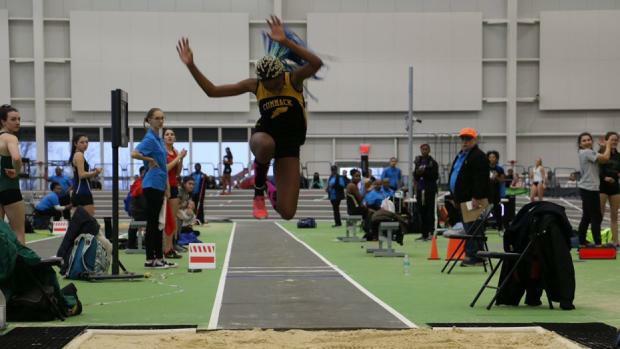 On Saturday she was entered at the Ocean Breeze Invitational, the last open meet at the facility that would hold states, and she exploded in the trials. Braxton unleashed a big mark of 41-2 to move on to the finals. It was a full foot personal best, and a new national leader to boot. And yet, she still had more jumps left. The Ocean Breeze meet organizers afforded her the recognition she deserved, and the whole facility focused in on her final attempt. With a hop-skip-jump, Braxton unleashed another 7.75 inches to her newly minted best, and took down the long-standing state record, finally resting at 41-9.75. Braxton took down the Record held by Shenae Dawkins (New Rochelle). Dawkins is one of the rare individuals to have three different individual state titles (55H, LJ, TJ) in her time in HS. Back in 2001, at indoor nationals, Dawkins let loose a 41-8.5 performance to take third that year. She was also a junior at the time, and it broke the standing state record. Onlookers say that Braxton has another foot and a half in her jump, so we could see this record take another jump forward before the end of the year. And of course, she still has another year to go after that. At just under 18 years old, the Triple Jump State Record was the second oldest Indoor State Record still on the books.